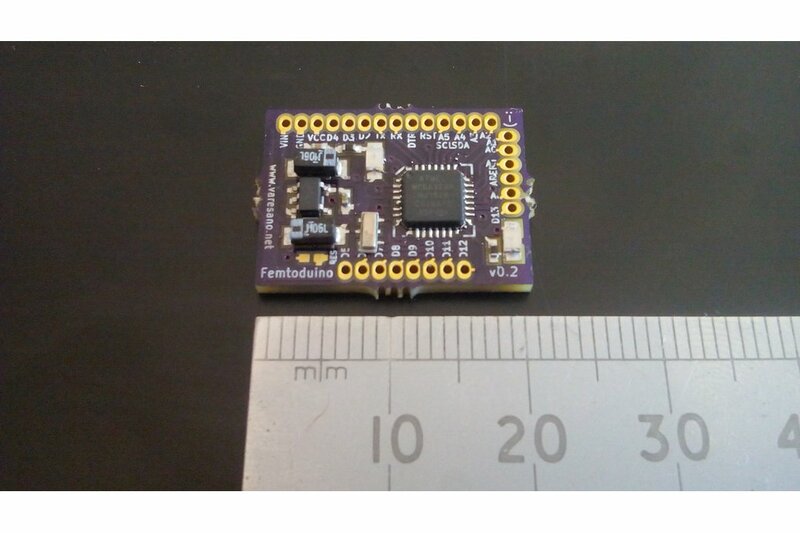 Femtoduino is an ultrasmall (20.7x15.2 mm) libre Arduino compatible board. An incredibly small (20.7x15.2 mm) Arduino compatible board running at 8 MHz and 3.3 Volts (can be powered off a Li-po or Li-ion cell). 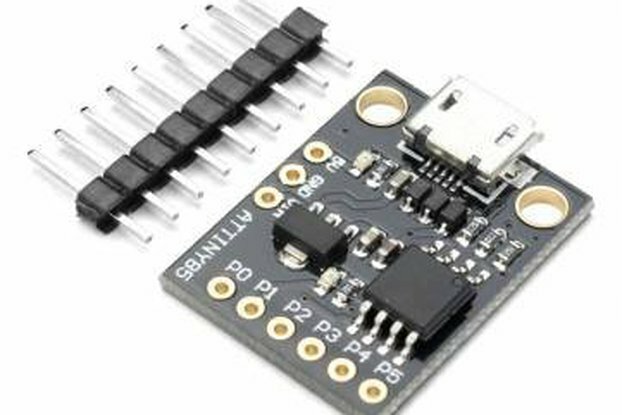 This tiny board has an on-board regulator allowing it to be powered with a maximum of 16 volts all the way down to 3.3 Volts. It has 2 built-in LEDs: one for power and one attached to pin 13 of the Atmega328 micro-controller. The board can be easily programmed using the Arduino IDE and a USB to serial converter in the same way as the Arduino Pro mini via Rx and Tx and is perfect for projects where small size, low weight (1.3g/0.046oz) and Arduino compatibility are needed e.g. model rocket altimeter, quad-copter, IoT device and wearable electronics. The Femtoduino has been manufactured using 2 layer PCB material with gold plated contacts. The board has 0.05" connectors. 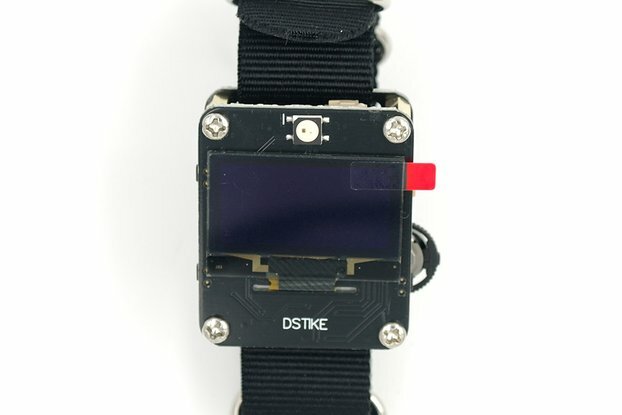 I made this to fund the development of future open hardware designs and products. Specially and carefully assembled with bootloader already installed and and rigorously tested in the UK. Each board is then carefully inspected for faulty joints and components. 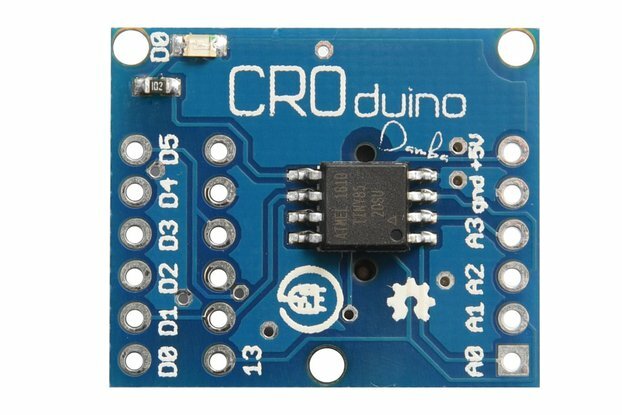 To program this board connect DTR, RX, TX, VCC and GND on the Femtoduino to your FTDI adapter. 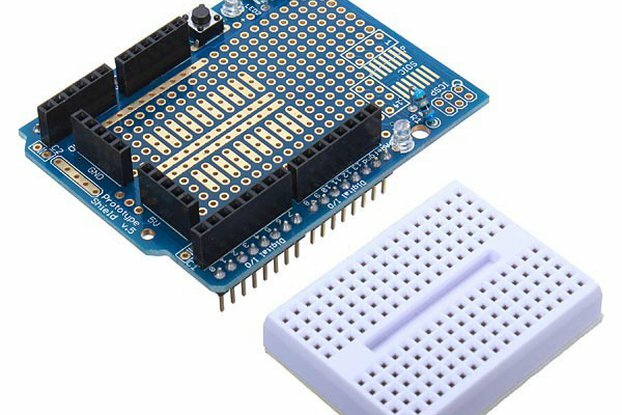 Choose the Arduino Pro mini as the board. Then change processor to "ATmega328 (3.3v, 8MHz)" and you are ready to upload your sketch. If you want to buy a large batch of Femtoduinos, just message me.